The 5th Buddy Dyer reelection Campaign Kickoff was held at The Abbey (100 S Eola Dr, Orlando, FL 32801). This was an invite only event, so I was happy Pam Schwartz the Chief Curator the the Orange County Regional History Center, invited me along. As we approached people were lined up at tables at the entrance signing paperwork presumably making donations to the campaign. Contributions are limited to $1,000 per person or entity. Entering the venue, there was an immediate crush of humanity. People were shoulder to shoulder, and we pressed our way in, negotiating through narrow gaps in the crowd. We met a few friends and then I pressed towards the media area. Media TV cameras were set up at the back of the dance floor and there was no one on the dance floor so we crossed over to some some tables where I found a spot I could sit and sketch. 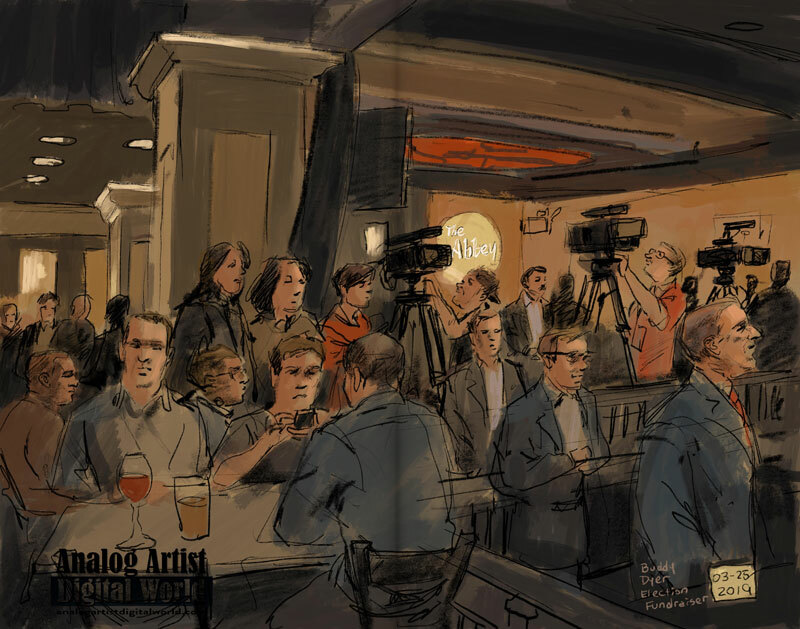 Rather than sketch the podium on stage, I decided to sketch the crowd behind the media. The Mayor's speech was short and sweet, defining what is great about Orlando. He pointed out the divisiveness in political discourse today and reminded us that after the horror of the Pulse Nightclub massacre, we responded not with hate of anger, but with unity and love. It is a shame the rest of the country doesn't learn something from what happened here in Orlando. The mayors address wasn't more than 10 minutes long, although he joked about having more pages of notes. He asked the crowd to shout out what they love about Orlando. I heard "soccer" to my left and then the multitude of shouts blended together. He said that he loves seeing families out enjoying the parks on the weekends and that Orlando is a great place to raise a family. Buddy has been instrumental in the development of the Dr. Phillips Center for the Performing Arts, and the new Lake Nona Community. In a list of the best cities to live in Orlando ranked 64th. I finished up the painting as the crowd dispersed. When the Abbey started flashing the lights, I knew it was time to leave with the rest of the stragglers. Buddy has been in office for 16 years. So far Dyer’s re-election prospects have not drawn a major challenge.